Bella Vita “ Beautiful Life” Tours are flexible, half day food and wine tours, that take in the wonders of the lifestyle, lives and unique businesses of the happy people in the Riverina. You will discover fine wines, from specially designed tasting menus at some of Australia’s most prominent wineries, and enjoy world-class regional produce as you visit places of interest. Working with Tourists, Corporates and Bus Groups, Bella Vita Tours create tailored itineraries to suit each group. Afterwards guests feel invigorated after experiencing an authentic day of La Bella Vita - "The Beautiful Life" that locals here are accustomed to. Visit Berton Vineyards Cellar Door this Easter weekend. Local art will be on display and for sale ad there will be platters available for sale on Saturday and Sunday. Enjoy a picnic on our lawn area. Tour a working winery and learn the history of the Riverina’s oldest winery and pioneering family of the McWilliam’s. Covered footwear is a must and hats are recommended. Enjoy an afternoon discovering the great local wines our Riverina region makes as well as the delicious food from our local cafes and restaurants. There'll be live music and plenty of space on the grass to chill out and enjoy a day out with family and friends. We have a range of ticket options available but be quick as numbers are limited. Prices shown do not include GST or online booking fees. Celebrazione, a day the whole family can enjoy! Enjoy live music in the garden over a glass of wine or craft beer. Alaina's Kitchen food and a bbq run by St Mary's P&C. Gold coin donation on entry goes towards St Mary's Primary School P&C. Enjoy a tasting class of different aged fortified wines, conducted by Chief Fortified Winemaker Russell Cody with some wine coming directly from barrel. Rewind in the Vines returns to the lawns of the Miranda Winery in Griffith on Saturday 23rd March, 2019! The festival will celebrate classic Australian music and culture, featuring some of the country’s biggest names in rock history. Enjoy a day of iconic hits, fantastic local food and wine supplied by the Riverina Winemakers Association, and kid’s entertainment, so all ages can enjoy the festivities. With live performances from The Angels, Diesel, The Black Sorrows, Choirboys, Radiators, Pacific Avenue, Happy Avenue and Side Effect, 2019 is set to be the biggest Rewind in the Vines yet! Thanks to the Griffith City Council for their continued support. Head to their website for more information on places to stay and things to do while you’re visiting Griffith. Riverina Winemakers Association invites you to come try our wines in the Riverina Alley. This March you can now have a go at making your own grape juice, by picking your own grapes, crushing (or stomping!) with some of the traditional equipment the Biz Nonno and Nonno (Great -Grandfather, and Grandfather) use to use to make grape juice. A family friendly day out, you can expect fruit picking, farm tour, some traditional grape stomping, farm fresh honey and a delicious morning tea of Italian Biscotti and fresh fruits. Bring a bottle to take home your own grape juice! Self Drive or Pick up available in Griffith CBD. Address Provided once booking confirmed. Experience a Leeton first. The release of two Pinot noir wines created by winemaker Robert Bruno matched to a Tapas style menu. Four courses + Four wines - only $60pp. Book your table now 69537300! For 90 years the ‘La Tavola Lunga’ has been a central part of the family business, to share good wine, good food and good times with family and friends. Join us at the De Bortoli Bilbul estate for a long Italian dinner with carafes of wine and live music to help us celebrate nine decades of winemaking. Dress up in your finest and join us for our local wine industry’s biggest night to see who will scoop this year’s prestigious awards at the Riverina Wine Show. 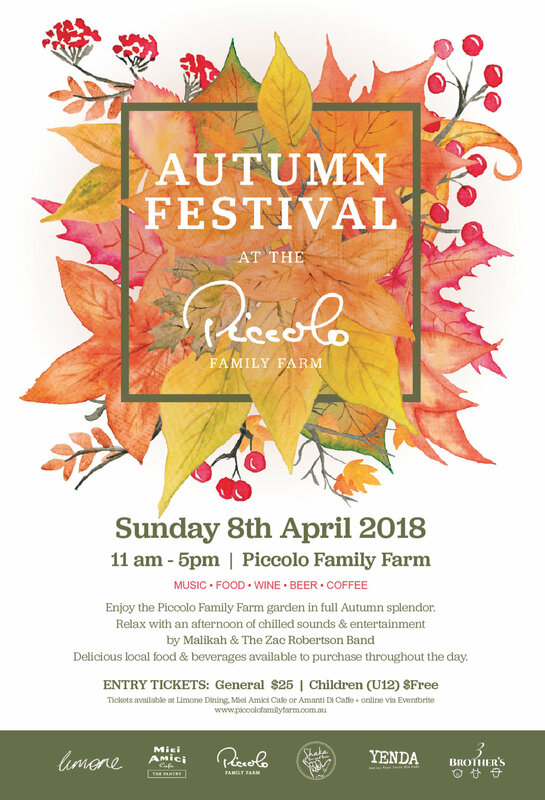 The awards and wine will be flowing over a sumptuous three course dinner by local chef, Luke Piccolo from Limone Restaurant and live music throughout the night. This black tie affair is one not to miss. Tickets are $115.50 per head (incl gst). Book your spot now by emailing info@riverinawinemakers.com.au or calling Carrah on 0427 660 151. Tickets can be invoiced to your business or directly charged to your credit card. The Riverina Winemakers Association are proud to present the inaugural "Little Italy under the stars" event. Come and enjoy and afternoon of Italian wines and food before settling in to watch an Italian themed film in the beautiful park at De Bortoli Wines, Griffith's oldest Italian family owned winery. WINES: Enjoy a tasting and grab a bottle of your favourite wine in the De Bortoli cellar door from 9am - 6pm PLUS you can try a range of Italian varieties from our Riverina wineries at our unWINEd Riverina bar in the garden. No BYO alcohol allowed. TICKETS: Book allocated seating or byo your own rug or chair with our general tickets. 4 years and under free. MOVIE: Roman Holiday released in 1953 is a delightful, captivating fairy-tale romance shot entirely on location in Rome. The film's bittersweet story is a charming romantic-comedy, a kind of Cinderella storybook tale in reverse. A runaway princess named Princess Ann (Audrey Hepburn), during a goodwill tour of Europe, rebels against her sheltered life and royal obligations. She escapes the insulated confines of her royal prison to find a 'Prince Charming' commoner - an American journalist-reporter (Gregory Peck) covering the royal tour in Rome. Rated G.
Vino & Salami Tasting + much more! Sample a selection of alternative wines and experience traditional cured meats and Italian sausages from Ferdinando Foods. Find a spot outside and enjoy the live music from Duble all day in our Tuscan garden. Salami & Cheese antipasto platters and gourmet Italian Sausages will be available to purchase from Ferdinando foods. Also available to purchase from Bertoldo's bakery will be Italian sweet treats, coffee and gelato! Whilst you're here make sure to take advantage of the great deals on the popular Private Bin range. It's back! Brought to you by the teams Yarran Wines and Zecca Handmade Italian; celebrate the opening of the Festa Delle Salsicce (Salami Festival) weekend with us! Enjoy an after work drink or maybe arrive a little earlier for dinner. All wines will be from the new Yarran range 'A Few Words' - including the little gold medal winner Whole Bunch Heathcote Shiraz! Limited space available so be sure to purchase your tickets early! Tickets $20 available through Yarran Wines. HURRY! Saturday: Antipasto platters & Aussie BBQ to enjoy in our grounds with our selection of wines including the new Alternis range. Sunday: Live music by Double Shot from 11am-3pm. Antipasto platters & Aussie BBQ. Keen to grab a flight this June long weekend? Do it at Yarran Cellar Door! Wine flights, matched with suggested food pairings from Sam himself! Sip, sample and settle in out on the Terrace for the afternoon with your preferred drop! Flight $25 - includes a flight of five different wines and sample pairings of sweet and savoury goodies. Berton Vineyard will be showcasing award winning wines carefully matched with seasonal produce by Griffith Leagues Club's Head Chef, Barry. Taste the wines, speak to the winemakers and enjoy a night out at the Griffith Leagues Club with friends. Includes a variety of Berton Vineyards carefully selected wines with an array of meals including alternate entree, mains and dessert! New music festival to the Riverina area, combining the magic of classic Australian music with great local food & wine. Come and celebrate some of the best Australian music at the Old Miranda Winery on Sunday the 1st of April 2018 (Easter Sunday). Head to the Rewind in the Vines Facebook page or website to keep up to date with all the latest information, and to find out how to sign up for access to pre-sale tickets. A low key Sunday on the lawn listening to some tunes from 1pm on wards. BYO picnic and mates. We will have some antipasto plates available until sold out and plenty of wine that will not sell out for all you Easter animals! Join De Bortoli Family Winemakers for a day of fun with your family and friends at their annual Celebrazione event. Find your spot in the gorgeous garden area and relax over a glass of wine and some lunch while the kids take advantage of the playground and free activities. They might even get to meet the Easter Bunny! Live music by Nathan Lamont in the afternoon is a great way to unWINEd in the Riverina this Easter. More details to come. Entry is only a gold coin donation which we put towards one of our local schools or charities. SOLD OUT! SOLD OUT! SOLD OUT! SOLD OUT! SOLD OUT! Note: Booking + payment processing fees applies to each order. see below for further details. We're pleased to announce an increase to our crowd capacity has been approved to allow more patrons to attend in 2018. In 2017, our inaugural event sold out - don't let that happen to you this year and book those tickets now! Have the ticket prices gone up in 2018? Yes. For the event to be able to expand in its second year and allow more people to attend this means increased costs in security staff, toilet facilities, lighting, tables, chairs and more. Is there limited tickets again this year? Yes. There are 2000 tickets available for public sale. There is no limit on the different ticket types, once 2000 are sold that will be it. Can you buy tickets on the day at the gate? At this stage, no. If the event is a sell out again in 2018 we will look at options with our security team to possibly be able to manage crowd numbers on the day. Can you explain why there is three ticket types? The Festival ticket is for 18+ attendees who would like to consume alcohol at the event and they are supplied a wristband, glass and lanyard on arrival, this costs $20. We have an Entry Only ticket for those who do not wish to drink but would still like to attend and enjoy the music, food and overall atmosphere with their family, this costs $10. Under 18s tickets have been made available so those who want to have a family day out with their kids being able to attend and not worry about finding babysitters, this costs $5. It should also be noted that under 18s will not be allowed in without a parent or guardian. Under 18s will not be allowed through with older friends or even their siblings. Food + non-alcoholic drink vendors. There will be a stallholders guideline released in the new year outlining rules for 2018. Please refrain from contacting us about a stall until this has been shared with you. If you're keen to volunteer on the day please email info@riverinawinemakers.com.au - most volunteers will be utilised on supporting the entry gate. Come by Berton Vineyards Cellar Door for tasting and sales of our award winning wines. Whilst your here take in the local art display and buy a piece for yourself or as a gift. We will also have some delicious local produce for sale as well. Join McWilliams’ winemaker Kylie Wheeler & Assistant winemaker Stephanie Lucas at Pages on Pine’s unWINEd night, Saturday 24 March 2018. Indulge in Chef Eric Pages casual 5 course French style street inspired food specifically matched to 5 wines produced by both winemakers. Friday evening from 5pm-9pm: Wander through the stalls of local wine and food. Grab a glass of wine, a plate of food and a spot out on the lawn to enjoy some chilled out local music with your family and friends. Saturday 11am - 7pm: It's market day again with our food producers in tow. Grab some olives and a glass of pinot grigio or some salami and a glass of montepulciano. The best of what wine and food producers will be on offer to sample and buy. Canapes on arrival, then sit down to enjoy a four course meal consisting of an entree, main, dessert and cheese platter. Each course is paired with wines selected by the Yarran Wines winemaker and owner, Sam Brewer, to showcase his styles. Enjoy a weekend under the vines at Calabria Family Wines where you can sample local alternative wine varieties from our Private Bin range and try traditional cured meats and Italian sausages from Ferdinando Foods. Dress up in your finest and join us for our local wine industry’s biggest night to see who will scoop this year’s prestigious awards at the Riverina Wine Show. The awards and wine will be flowing over a sumptuous three course dinner by local chef, Luke Piccolo from Limone Restaurant and live music throughout the night by the talented Nathan Lamont. Canapes on arrival, then sit down to enjoy a four course meal consisting of an entree, main, dessert and cheese platter. Each course is paired with wines selected by the Calabria Family Wines winemaking team to showcase their styles.